I have been so blessed by reading all of your shares and peeking into your journals! Thank you all for taking part and I look forward to sharing and peeking this week again! Have any of you participated in Writer’s Groups ? I have done a few different types, more so back in my Pre-Family days! Remember, you have a full week to submit and then we start again! Make sure and be blessed by visiting a few others or at least one other person, and be sure to leave a comment so they know you stopped by! We don’t have a Badge for this Blog yet, but if you just link back to this in your post that will work. 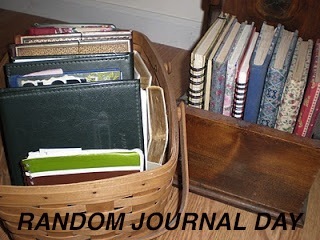 (Random Journal Day Weekend Link Up) If anyone wants to make us a BADGE we will welcome you as a co-host with us! Hey Dawn (and others),I haven't been in any writing groups recently, but spent almost a decade working on a novel with an editor and agent, which was like a double-team writing group…a novel which finally failed, I should say. Sadly. So blogging is my way of breathing since then. I'm loving this journal link-up, both personally and as a way to connect to others. Hey Dawn…I just linked up again, a day late as usual…but I hope it's not too late. Sorry! Thank you again for making this available to us! I love reading what others have written. Makes me feel “normal” like them! lol!! Such great links from those 2! Very inspiring, so glad we are doing this. Now I gotta grab a journal! Yes, Susie- I agree! I will be linking up late! However I am grateful to have these to read already! Wonderful! Dawn: I participated in a writing group for most of ten years. I had to step away from it, although the group did focus on writing, I became uncomfortable with the way some issues were handled. This sounds fun! I think I will be joining a journal day soon.